The group outside the Coldra Court by Celtic Manor Hotel with Mainline Coaches. The UK travel trade saw some of the very best of the South Wales tourism industry this week [29-31 Jan]. The Southern Wales Showcase – now in its third year – welcomed over thirty group buyers from all over the country. The coach and tour operators and group travel organisers attending were shown some high quality attractions, venues and destinations during their three day fact finding visit. Arranged by Southern Wales Tourism, coordinated by UK travel trade specialists Steve Reed Tourism from Hampshire and working closely with the South Wales tourism industry, the event was all about generating new bookings. Some of the tour buyers stayed for two nights at the Coldra Court Hotel by Celtic Manor in Newport – from that base they took in tours of the local area with Steve Griffin, Blue Badge Guide looking after the group and answering questions about the tour. 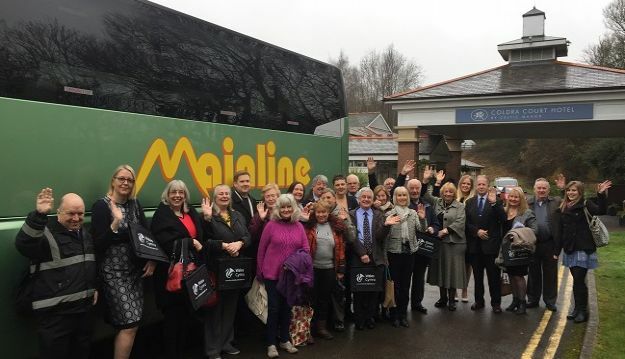 Mainline Coaches were the transport provider for the group during their visit to South Wales. The group visited Penarth Pier Pavilion near Cardiff before a tour of the Wales Millennium Centre. Llancaiach Fawr Manor – a 16 century manor house – near Caerphilly was their next port of call before the tour buyers met the tourism industry face to face at the Wales National Velodrome in Newport. At the Velodrome the attendees were able to do business with hotels, attractions and destinations from across the wider region.Dinner and a show’round at the St Pierre Marriott Hotel and Country Club near Chepstow was next for the buyers on their schedule. The rich history of the South Wales area was experienced at the Blaenavon World Heritage Centre and at the Guardian, Six Bells Mining Memorial. Cyfarthfa Castle Museum and Art Gallery was on the itinerary before the group concluded their familiarisation visit with a call into the Royal Mint Visitor Experience at Llantrisant. 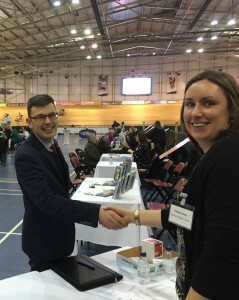 • Vicky Jones of Southern Wales Tourism with Tim Balcombe of Norman Allen Group Travel of Hereford, at the Velodrome Showcase. ‘We were so happy to welcome the tour planners to South Wales so they could experience much of what we have to offer to groups and coach parties. Already bookings have been made – even during the event itself,’ says Vicky. ‘The event is our third in succession and it has really helped to get our part of the world noticed to the wider tourism industry in the UK. And of course we’d like to thank the many businesses that have helped to provide such a great welcome for the buyers, that is much appreciated.